This book has a ton of great content and is a perfect how to guide book if you are willing to practice, change and learn better techniques in listening. The values of listening are explored from many roles, and the tools you acquire from this book help in many separate areas. This includes business relationships, selling to clients, customer feedback, friends and family relations, and in every way, simply understanding better what you hear. Overall, the book is very practical in that it gets right to the point and has guides, exercises and specific things to do to improve your listening and your communication in general with other people. 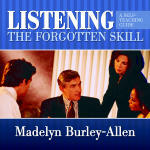 Its straight forward, easy to read and very useful to quickly improve your listening. Note : I started out listening to this as I do with many books thinking that listening to a book about listening only makes sense. The problem is, the audio version of this book read by the author is probably the worst I have ever heard for an audio book. She mumbles, is incredibly monotonous, pauses at strange times, breathes heavy and flips pages very loud. The book is simply not written in a way that can be listened to easily. There are many tables and comparisons of good and bad approach to listening which doesn’t work well read, it needs to be seen. A professional reader should have recorded these so don’t waste your time on the audio version, its awful. Get it on paper. I’d only give the audio version a 1 out of 5. Its nearly useless. I have a copy of this book from 1982! I guess it is the 25th anniversary of it. I found the book very helpful and have recommended it to others. I will have to get the new edition but I will avoid the audio-book based on your thoughts. Today I was with management workshop. One of the exercises was to identify personal strengths. I was the only one who identified myself with this strength, but then I removed it since I know I have a lot to improve in this area. It is actually my weakness but I know it I need to improve on it. I will check with our library if they have this book. Thank for the pointer. Allow me to post a not-so-related comment: Would you, in general, recommend an audio book over reading the actual book? Lately I have been listening to audio books more than reading them — not by choice but to make the best use of my time. I find some audio books, especially those read by the authors themselves, are good. However, I miss the pleasure and satisfaction of reading the actual book. And am not sure how soon I will forget the material from an audio book. Thanks in advance for sharing your experiences. Khalid, its certainly related to this post especially since I mentioned the audio vs book for this one. I think the read book versus audio book is more a personal preference. For me, I get through a lot more audio books than read books but only because I’m very good at audible learning, many people are not so don’t enjoy audio books as much. I find I can remember MORE from an audio version than a written one sometimes but it depends how focused I am. I often listen to audio versions more than once as well, where I have yet to ever read the same book twice. I often listen to audio books while doing creative graphics work on the computer which is easy since its opposite sides of the brain. I also find listening and focusing on an audio book is easy when ever I’m exercising or doing house work or renovations. I just don’t take enough time to site down and read but I definitely enjoy that also. So, both are good for me, but I just have a lot more time to listen than I do focused reading. I get through a lot of audio books (sometimes the second time over) at work through the day as well.